Oahu wedding photographer - Are they really that good? People often make the mistake of asking a relative or friend to be their wedding photographer. Do not make the same mistake, especially if you are organizing your event in Oahu. This Hawaiian island boasts of its white sandy beaches, scenic waterfalls, green tropical gardens and the Ko'olau Mountains as awesome backdrops for your photographs. Your friends or relative are not likely to be able to fully justify the beauty of this place if they are not professional photographers. An Oahu wedding photographer, on the other hand, is well acquainted with the best locations of this area and can also offer customize packages to suit your specific needs. Moreover, an Oahu Hawaii wedding photographer will have the required equipments as well as experience and an eye for detail. All these factors are extremely important to ensure that you have the best pictures for the moment that will come only once in your life. Moreover, such professionals will also know the best time and venue for organizing the party. Most importantly, they are the best people to capture great sunset photos with your partner. This, especially, is not an easy task for novice photographers. Where to find Oahu wedding photographer? Finding such professionals in Oahu is quite simple. For most of the resorts and hotels offer such services within their packages. The planners too can help you in this respect. In addition, you can also search these professionals online. In fact, most of them have their personal websites with photo galleries. You can check their work online. 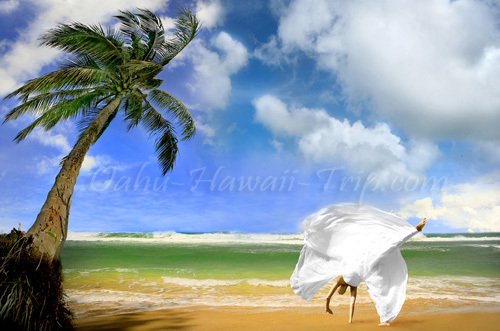 Moreover, some Hawaii wedding photographers also offer customized packages at great discounts. Make sure that these professionals have all the equipments at hand and are experienced enough to take stunning snaps for your big day. How to select the perfect photographer? While selecting a professional wedding photographer, there are certain factors that you need to keep in mind. Though you can follow leads from advertisements, remember to check their portfolios from any previous wedding. Make sure that the pictures are consistent in quality. You will also have to decide the style. You can either have traditional photos or have an artistic touch added to it. Check whether or not your wedding photographer suits your style. Also decide on the fees, since after all, it is you who will have to fit it within the limits of your wedding budget. Share Your Oahu Weddings or Romantic Holiday: We're looking for stories, experiences and tips from any romantic Oahu Hawaii vacation or getaway you've been on. Why not take a few moments and Share it with everyone!